I like Russian literature, and I’m pretty keen on small publisher And Other Stories too – it’s a surprise then that it took me so long to get around to today’s book. Still, I got there in the end, so let’s head off to the Kazakh steppe, to spend some time in the company of a certain army officer with a liking for potatoes. Having decided, then, to stay in the army, Khaborov rises slowly through the ranks, ending up in charge of his very own prison camp. However, if you think that Khaborov is a success, you’re sadly mistaken. For a man of his advanced years, only having reached the rank of Captain is a bit of an embarrassment, and the camp he is in charge of, a shambles of a place in the middle of nowhere, is the ideal location to bury a man nobody really cares much for. 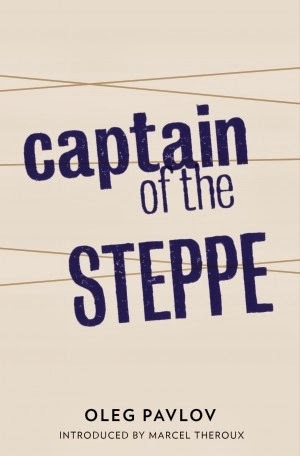 The concept of Captain of the Steppe initially had me thinking of something along the lines of One Day in the Life of Ivan Denisovich; however, at times it’s more like a Russian version of Hogan’s Heroes (although the prisoners are conspicuous only by their absence…). The soldiers are men stranded in the middle of nowhere, robbed of part of their wages, and consequently unwilling to do their duty properly. Of course, the officers then use this as an excuse for reducing their wages further. Trapped in the vastness of the Steppe, the reader sympathises with the soldiers – it’s big, remote and depressing, and surviving on starvation rations doesn’t exactly help matters. Thus, Khabarov’s simple idea, planting some of the potato rations, causes an uproar. The men are horrified, but the captain, determined to do something to break up the tedium, stubbornly pushes through. In its noisy belly, this lorry contains a secret service man, Skripitsyn. He has come to tear strips off Khaborov for his temerity – how dare he think for himself? The novel is an interesting look at what was happening over in the East during the Cold War – for these men, caught in the Kazakh winter, it was very cold indeed. Over the course of the story, Khabarov develops into a minor hero, standing up to the mindless authorities, pushed to the point of breaking, but refusing to bend. It’s humour of the gallows variety, but it can be surprisingly effective (and funny). The humour is mixed with a more serious side though, and to be honest, I’m not really sure that it always works. I missed a consistency of tone throughout the book, and I was never quite lost in the story. I also felt that the frequent switch of location was a little distracting (I would have preferred more from the camp and less from the petty squabbles at HQ). This looks like an interesting book, Tony. A little man taking on the system – very inspiring. It looks from your review that things didn't end well for him – very sad. Thanks for introducing me to this new-to-me writer. Hope you enjoy reading his next book too. It does sound like you have taken the more serious aspects of this work and analysed those, but you indicate that this is interspersed with farce. I wonder if this kind of rough humour was a necessary thick skin you had to grow to survive Communism. I seem to remember some fairly horrible black jokes from our Communist days, which I found very funny (and yet very sad) at the time.